Welcome to the The Antique Locks/COLTi Forum - Industrial Archeology of locks..
Help, Rules, Guidelines and About this site. Information and Guidelines about our world The Antique-Locks forum. Please read before registering. New users please read prior to posting. A forum for new members to introduce themselves, ask for help in using the board and offer suggestions to Site Supporters, Moderators and Admin. Combination, Padlock, Safe, etc. or brands like Sargent & Greenleaf, Yale etc. or even use a combination of terms. Use the 'search box' to filter out the types or features you are looking for. Perhaps one of the earliest forms of a locking device. Post in this category all maner of Padlocks including: Combination, Fakes Fraud & Fantasy padlocks, Key Operation, Railroad, Seal, Story Padlocks, etc. Use the 'search box' to filter out the makers, types or features you are looking for. Post in this forum locks that demonstrate a Patent, or a Security Feature or even a Brand Name or Logo. You will find here Locks for: Doors, Furniture, Safes, Vaults, including: Combination Locks for Safes, Key Locks for Safes, Time Locks & Bolt Motors, Unit Locks, etc. The lockmaking scene changed late in the 18th century when the Industrial Revolution got under way and locking principles started to be explored. This forum therefore is for the many and varied interesting locks before 1778 where the fixed ward or spring barbs were the means of security. This appealing category is for single skin locking boxes and might include items like: Chests, Deed Boxes, Dispatch Boxes, Money Boxes, Toy Banks, etc., and made from a range of materials including, brass, cast iron, iron, steel, wood, plastic, porcelain, etc. Use the 'search box' to filter out the types and features you are looking for. 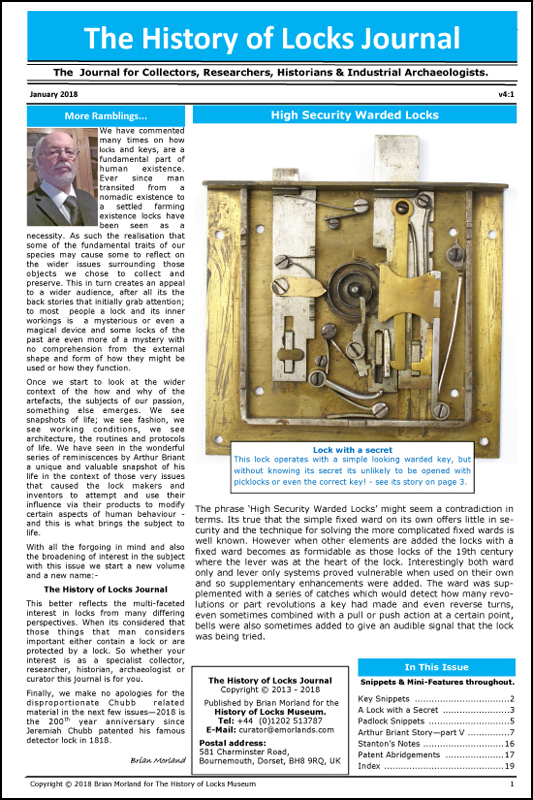 Huw Eastwood | The first double skin safes began to appear towards the end of the Georgian period. Tann, founded in 1795, claims to be the oldest safe maker. Post and explore here all antique/vintage double skin safes, Strongrooms & Vaults. Use the 'search box' to filter out the makers or features you are looking for. Pictures of Safe Plates, Escutcheons and other non lock hardware can be posted here. Our Mission, Our Artifacts, Our Archive - for reference and discussion. Our Mission, Our Artefacts, Our Library - for referance and discusion. For Reference and Comment... It’s estimated there are over 5,000 artefacts in our care and date from Roman 2nd Century keys to the Post WWII experiments with high security mechanisms. We present here selections from The Heritage Collection for your interest and comment. Browse our Library: Company history, Product information, Data sheets, Operating instructions for vintage/antique (pre WWII) security products & Press Cuttings - For Reference, Research and Discussion. Documents uploaded by Members from their own collections - For Reference, Research and Discussion. British Patent Specifications on locks and security devices - For Reference, Research and Discussion. Note: In this special sub-forum start a new thread for each new Patent Number. German Patent Specifications on locks and security devices - For Reference, Research and Discussion. US Patent Specifications on locks and security devices - For Reference, Research and Discussion. Press Releases, House Magazines and Publicity material from Yesteryear. Post here your letters, documents, flyers, catalogues etc. that are in a language other than English for members to assist in translation. Bibliography - on Locks & keys, or books containing substantial or useful information.